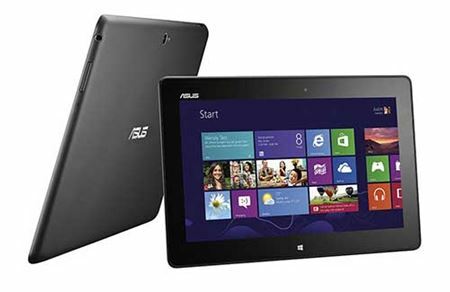 With the brand new touch focused Windows 8 operating system and advanced power saving capabilities of the next generation Intel Atom processer Z2760, with burst 1.8GHz., the VivoTab Smart offers a true mobile experience. Always stay on, connected and up to date! Simply link and pair up with various NFC-enabled devices and peripherals to read or share information. Ultra battery life for all day computing. Store and share with 64GB eMMC of built-in memory, a USB port and 32GB of ASUS WebStorage space for 3 years. With a 580g ultra portable and 10.1" design, enjoy the incredible multimedia experience with the IPS Panel and ASUS SonicMaster technology every moment! With Incredible 580g light and 9.7mm slim design make the ASUS VivoTab Smart the great tablet on the go! High brightness of 350 nits to tolerate sunlight usage with a super-wide 178 degree viewing angle for easy sharing. With an 8MP camera with LED flash, back-illuminated CMOS sensor and auto-focus function, ASUS VivoTab Smart helps to clearly capture every moment. The large aperture and backlit CMOS sensor combine to improve the quality of your photos in low light with less noise and increased clarity. It allows for faster shutter speeds too, thus reducing camera shake. ASUS Cloud enables access to all your documents, photos, music and more from any device. Easily share files with friends & family. SuperNote is a versatile multimedia note taking app that allows users to input & share through a variety of options: use your finger to draw. Include photo and video captures, or even audio notes. Plenty of media content is ready to enrich your life! Enjoy X-box videos, music and games on your Vivo Tab. Bing News/Finance/Sports/Travel provides great organized news and information. Connect all your social media accounts, with the main contact list view featuring larger tiles for your favorite contacts. Tap "What is new" for an at-a-glance summary from all your social networks.